I've designed Graphical User Interfaces for a wide range of web-based applications. Background ShipCycle is an early-stage startup company developing Web-based logistics management products. The open-source applications are built to be highly-customizable, enabling companies to tailor the product to their specific needs without the expense of a custom-built proprietary system. 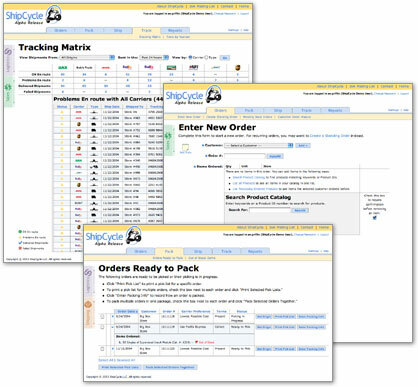 Project Using ShipCycle, a company will be able to enter an order, produce packing instructions, automatically generate the esoteric shipping paperwork, and track all their shipments with any carrier  all through a unified Web-based interface. The product also required interface elements designed to view, manage, and interact with vast amounts of diverse data. Following the same usability principles, I built tools to filter data and display results in a manageable (and customizable) presentation. In addition to design and HTML, I did much of the middle-tier programming myself, using PHP. Background The Learning Village was originally developed by an IBM research lab. Designed to facilitate communication and collaboration between teachers throughout a school system, it proved useful to districts that participated in the project. But the underlying Lotus Notes-based architecture was not practical for mass distribution, and the design left something to be desired as well. IBM partnered with Riverdeep to re-engineer the product as a modern web-based application, and I was brought on as design lead. Results Once the initial design and architecture were in place, the project was outsourced for completion and my involvement ended. Background TVGrid was originally developed as a feature of Student.Com, an online magazine for college students. As the first online TV listings site, it quickly developed a much broader audience than Student.Com's core demographic. Cable giant MediaOne stepped up with funding and TVGrid was spun off as a separate entity. I was brought on as Art Director shortly thereafter, and oversaw the design of the second and an unreleased third generation of the site. Project The TVGrid service was designed for private-labeling on partner Web sites as well as running on it's own at www.tvgrid.com. The core of the application is, of course, the titular Grid. While the basic concept is similar to other TV listings, our Grid remains unrivaled in its elegance, ease-of-use, and customization. Other features included powerful, user-friendly search tools and a variety of reminder options. The unreleased version featured an innovative new Grid format that organized shows based on the likelihood an individual user would enjoy a particular show. It also included a revamped search interface using a system of cascading filters. 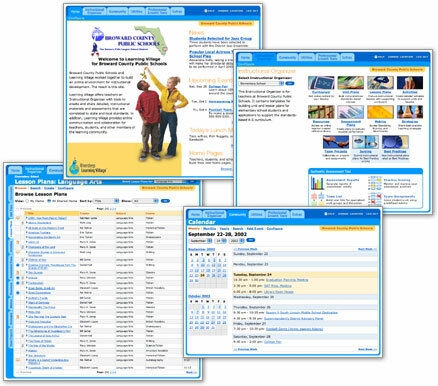 Results TVGrid ran for several years and was always highly praised by its members. Unfortunately it never found a sustainable business model. It went under during the dotcom die-off of 2001, leaving a void in the lives of many dedicated users. Status Offline (link goes to screenshots). 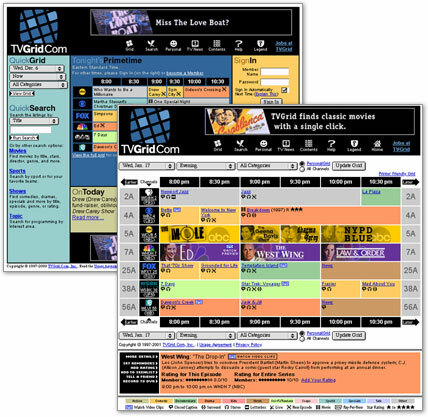 Background As dotcoms hit the doldrums in 2000, TVGrid looked to channel its online expertise into work developing set-top-box (STB) software. Project My task was to mock-up the Intelligent Program Guide (IPG), an STB application that would coordinate with TVGrid.com and be private-labeled for our target clients: cable companies. 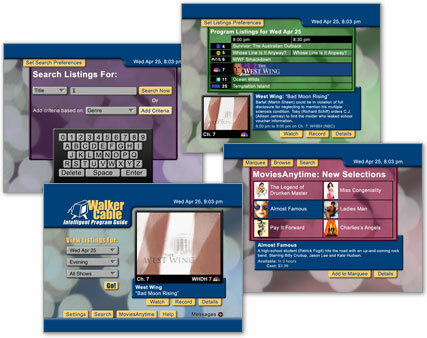 The idea was that cable companies would run the online version of TVGrid on their own web sites and the IPG on the boxes they gave to customers. Customers could then use the web site to perform tasks not easily done with an STB interface, such as construct complex search queries. Once constructed, these searches could be run from the IPG at any time. Additionally, program filters and other preferences established online would customize the IPG for a given viewer. The box would also have TiVo-like DVR functions, which could be controlled remotely through the online version. Results The product was pure vapor-ware until either a client or venture capitalist provided the funding for development. No one did, and TVGrid ceased operations in 2001. Status Undeveloped (link goes to mockups). 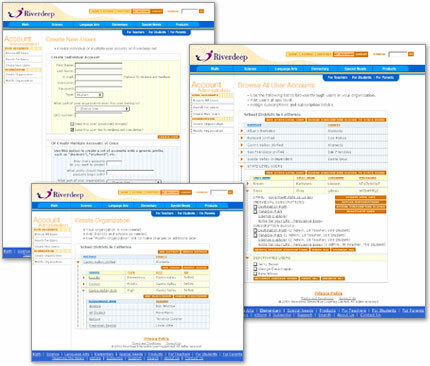 Background Riverdeep produced a number of subscription-based online products that were sold directly to schools or districts. This required a system for the purchasing organizations to manage and allocate their subscriptions. For example, a school district might purchase 500 subscriptions to a third grade math product. Each subscription would then be assigned to an individual student, who could log on to Riverdeep.net from any computer and use the product. At the end of the year, the subscriptions would be re-allocated to the next batch of third graders. Project There are three main components to the Account Administration system: the delineation of an organizational structure, the creation of individual user accounts, and the allocation of subscriptions. The system was designed to work with an existing Riverdeep product, the Learning Management System, which tracked student performance. I designed the screens and wrote a comprehensive design spec for the development team. Results During the development phase, Riverdeep underwent a corporate re-organization and shifted focus to consumer products.